We had a great time in Melbourne and met a lot of stitchers. I had taken my Schwalm mat with me which I managed to do some stitching on and got lots of comments on, many women said they had not seen the pulled thread boarders since they were young. I then had to tell them that that was just the beginning and there was much more to come in the middle. There was also much interest in our Slate frames and on the Friday morning before the show got busy, I started stitching the branch for the Owl to sit on, I thought he was sick of floating in air. I then managed to loose my thread and did not find it again until the end of the show, so I could work no more on him until I came back. 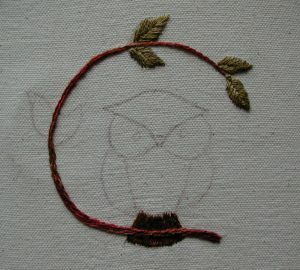 I have worked the branch and leaves in Primke stranded and the Owl's tail in DMC.